With a friendly tip of the hat, a demonstration of the fine art of angling is about to begin — and Goofy results can be expected. Goofy first appeared in “Mickey’s Revue” in 1932 as a bit player, sporting whiskers and square spectacles. 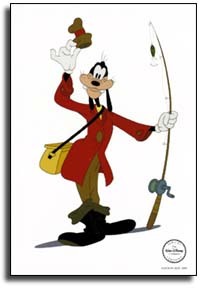 Walt Disney often described the physical humor used in the Studio’s cartoons as “goofy”, and with “Orphan’s Benefit” in 1934, that name officially stuck to the character.